Pano of SoCal Soccer Complex where the girls compete during Surf Cup, taken during Blues Cup 2015, one month after Surf Cup. Click on image to enlarge. About 25 full-sized fields covering an enormous area – this photo doesn’t do it justice. On the far right you can just about make out the car parking area. 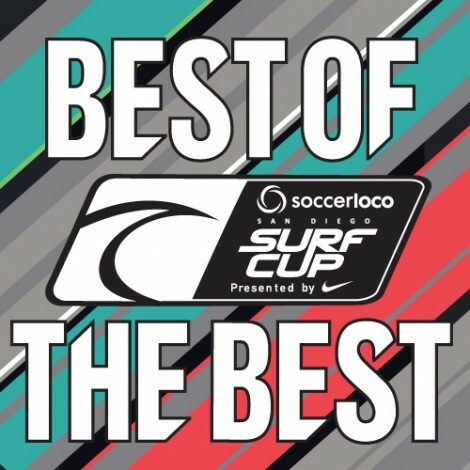 We just returned from the elite Surf Cup Tournament in Oceanside, CA (http://www.surfcup.com/). This is arguably the top tournament for youth soccer in the country. Or at least in the Western half of the country. Both of my daughters played (U10 and U13) – the younger one didn’t win a game, the older one went to the Final but lost on penalty kicks against a team from Seattle. Irrespective of win or loss, this tournament was a very good experience for my older daughter from both a soccer development and team bonding/social perspective. The tournament was well organized. It’s a nice venue, the referees were good, games started on time, the hotels are good, the area has many restaurants and attractions including nice beaches, Legoland, and shopping. So I can fully recommend the event. However, I wonder if the younger kids really have to travel to tournaments like this. There is a lot of competition and quite a few tournaments in our home region and I strongly suspect that the player development of younger kids won’t suffer if they focused only on regional events. Keep in mind that the cost for Surf Cup for one parent and one player is around $1,500 to $2,000 (including flights, hotel, rental car, and dining), depending on how long the stay is. Then there’s the time lost for the parents – pretty much the entire weekend plus often an extra day to travel on a Friday and Finals are typically on a Monday. So this can be a four-day commitment. Add more money for every additional parent and/or sibling, of course. We decided to drive from our SF Bay Area to the tournament because we made it a family trip (for six of us). This saved a lot of money on flights, but the hotel cost increased, of course. Just the hotel was $1,350 and each meal ended up being ~$100 for a total estimated cost of around $1,800 (including fuel and misc cost). Keep in mind that families have to stay in tournament-mandated hotels, which is typical for tourneys like this. So your ability to shop around for cheaper hotels or stay with family is limited. Of course, the tradeoff to ‘only’ spending $1,800 is that we spent nine hours door to door on the road, each way. My older daughter also played in the Manchester Cup at the same venue in June and will be playing in the Blues Cup at the same venue in early September. So we are spending roughly $4,500 this summer just for her three tournaments. She is a top player and old enough to benefit from the experience, so we are making this commitment in money and time for her. But for boys and girls younger than her we simply don’t see the value. Competitive youth soccer is already costly without these travel tournaments. Regular season fees are roughly $1,000. Add to that cost for additional weekly clinics, equipment and uniform plus local/regional tournaments and the time it takes to bring them to practices and games. Total cost for a typical year is roughly $3,000. I just don’t see the value of a nine year old (U10) playing in a tournament in San Diego that costs $1,500. My suggestion is to wait until the kids are at least 12 years old (U13).